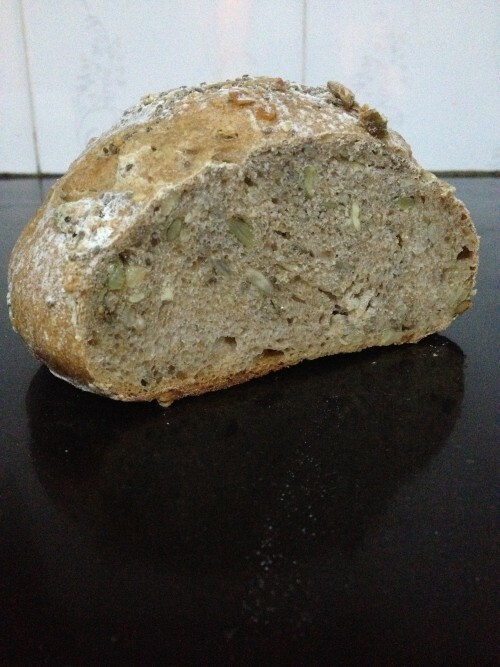 Multi-seeded wholemeal bread is by far the best thing that I bake here in Cambodia. It’s better than any cake, biscuit or pie that I’ve made and any macaron that I’ll attempt to make in this humid heat. I’ll give you three reasons why. It tastes nuttily wholesome and super-yummy. I love wholemeal bread and I’ve yet to be able to buy wholemeal bread that tastes like proper British wholemeal bread, anywhere in Phnom Penh. You can’t go wrong with it. When your oven has no temperature gauge (like mine), you know that you’ll be safe whacking the oven on the highest heat and leaving the dough to bake in the oven without fear of sinking, like you’d get in a cake. It took me a few months to find wholemeal flour, mind. I came across farine du blé noir and wholewheat flour on the shelves in Lucky Supermarket and stood scratching my head as to whether either of them was wholemeal flour. I was pretty sure that wholewheat flour was the american name for wholemeal, but farine du blé noir? As I discovered later with the help of google search – that’s french for buckwheat flour. Not exactly what I was looking for. 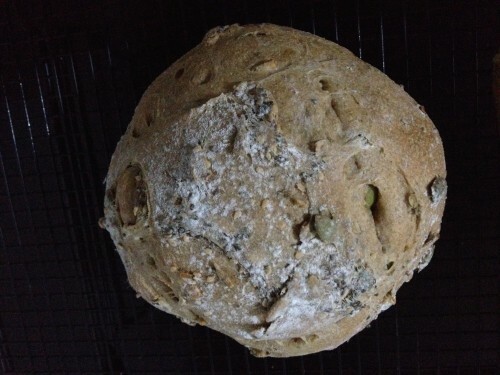 Then it took another few weeks before I could bake the bread. My left knee twisted one November evening as I was lying in bed and I was in excruciating pain. I couldn’t walk, straighten my knee or put any pressure on it. Visits to multiple doctors, an X-ray and MRI scan later revealed severe inflammation and fluid caused by a fall off a motorbike several months beforehand. Walking on Phnom Penh’s uneven surfaces, hopping on and off tuk tuks and motos had served to aggravate the injury. My mum advised me not to do any baking that required standing up, and have you tried to hand knead dough sitting down? Not worth the effort if you’re as short as me. So, I was pretty much laid up on a sofa with an ice-pack on my knee for the best part of a month and a half. 2 weeks in, I was pretty bored. So I hobbled out on my moto to buy some wholewheat flour from Lucky and made my first wholemeal loaf. It was overproved and underbaked. But when I tore off that first piece of bread and bit into it, I was the happiest little baker in the whole of Cambodia. I’m pretty sure no-one rivalled my happiness. Then my tastebuds started hankering after a multi-seeded loaf, like Warburtons Seeded Batch. I was reading Richard Bertinet’s Dough and realised that I could just experiment by putting some seeds into my bread recipe. And that’s how I came up with my multi-seeded wholemeal bread recipe, which as you know, is the BEST thing that I bake in Cambodia. I think that part of the reason for why the bread tastes so good is that I’ve always allowed this bread to have a slow rise in the fridge to give the flavours a longer time to mature. However, I don’t think that it’ll ruin the flavour of the bread too much if you a) don’t have enough room in your fridge or b) want to biting into it within 3 hours from start to finish. I find that I can’t eat a whole loaf in time before the humidity causes the mould to break out on my bread 🙁 ! Thus, I’ve taken to making two smaller loaves and freezing one loaf once I’ve baked it. So, here’s the scrumptious, nuttily, wholesome Multi-seeded Wholemeal Bread recipe, with it’s foundations in Richard Bertinet’s Dough. 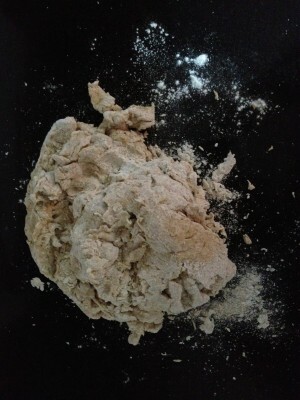 250g wholemeal flour – use strong bread flour if you can. 1. 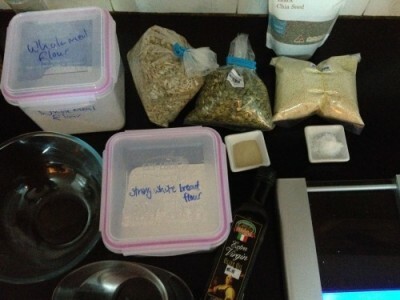 Measure out both flours and yeast in a medium-large bowl and mix. Then mix in the salt. I’m in the habit of adding the salt at this point so that it won’t touch the yeast. 2. Add the water and oil and stir to combine. I use a scraper at this point to combine the ingredients, but you can use just your hands. It’ll make a wet dough but don’t be scared by it. The wetness of the dough should ensure that it’s a soft texture. Turn it out onto your work surface and knead. If you’re like me and a bit slow at kneading, it’ll take about 15-20 minutes. Of course, you could use a machine fitted with a dough hook. In which case, put all ingredients for the dough into a large bowl, ensuring that the yeast and salt are added to opposite sides of the bowl. Mix on a slow speed until it all combines and then move it onto a medium-high speed for about 10-15 minutes until the dough is smooth and elastic. 3. Measure out the seeds into the same mixing bowl that you used for the bread dough. 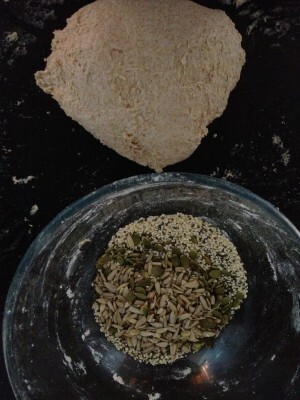 Add the kneaded bread dough to the same bowl and work the seeds into the dough in the bowl. Sometimes, for the last few minutes, I’ll finish combining the seeds into the dough out of the bowl . Top Tip: Work the seeds into the dough in the mixing bowl to prevent the seeds from escaping everywhere. 4. Pour a little bit of vegetable oil into the bowl and lightly cover the dough with oil. This helps the dough not to stick as it rises. Cover the bowl with cling film and leave it for an overnight prove in the refrigerator. Alternatively you could leave in a warm place for at least 1 hour and doubled in size. 5. Prepare your baking tray or loaf tine. 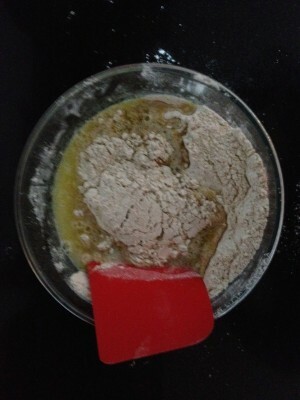 Once the dough has doubled in size, gently place it on the work surface and gently press down on the dough with your fingers to release the gas. Do this into a rectangular shape. I find this works just as well as punching the dough – a tip I learned from Richard Bertinet. Strengthen the dough by folding the dough a third of the way down into the middle, press down with the heel of your hand. Repeat with the other side, then fold over the middle and press firmly with the heel of your hand. The dough should feel firmer and stronger. 6. Lightly flour the surface to shape the dough. For a round loaf, like in the photos, I tuck the ends into the middle of the bread, turn it over so that the tucks are on the bottom, keep one hand as still as I can partly under the cob and then use my other hand to turn and shape the dough into a tight, round shape. 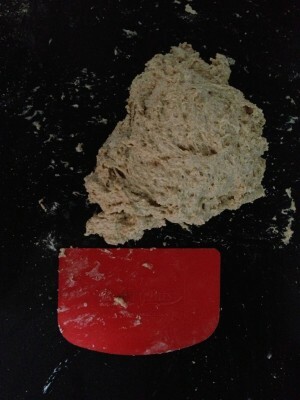 Here’s a link to The Fresh Loaf on shaping dough, as a visual aid. 7. 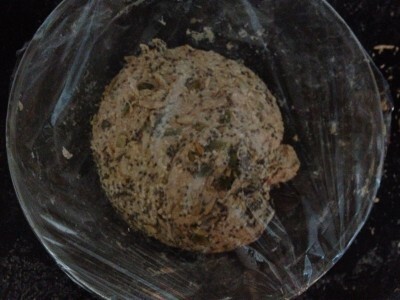 Transfer onto a baking tray/loaf tine (depending on the shape of your loaf), cover loosely with cling film or a tea towel, until doubled in size. This might take 40 mins – 1.5 hour. 8. Meanwhile, preheat the oven to 250°C/480°F/Gas Mark 9. 9. When the dough is ready. Cut deep, clean incisions to help create shape and to help release gas. On this loaf, I made a big hash sign (#) but made the mistake of not flouring my knife beforehand, so the dough stuck to the blade. Lightly flour the top of the bread. 10. Spray the inside of the oven with water to create steam and put the dough into the oven. Bake for 10-15 minutes at 250°C/480°F/Gas Mark 9 then reduce it to 220°C/425°F/Gas Mark 7 for another 40 minutes. Check whether the bread is ready – it should make a hollow sound when you tap it’s bottom. If not, set the timer for another 10 minutes and check again. p.s. Oh and what happened to my left knee? I’m delighted to report that it’s on the mend. Have I told you that Claire (of the white chocolate, oat and raspberry cookie fame) is also a physiotherapist? She gave me some physio advice and taped up my knee while I was in New Zealand. I’ve faithfully been doing my exercises twice a day and resting it up lots. However, I reacted to the tape so progress has been slower than I’d have liked. I’ve not been able to dance or jump or walk for 10 minutes without regretting it the next day. Last week, I went to a conference in Singapore called Kingdom Invasion, where they prayed for healing for my knee. 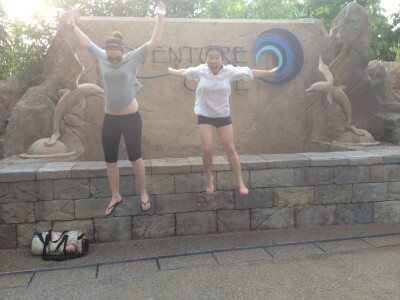 Whilst I was in Singapore, my knee got a lot better. Good enough that I can jump, dance and swim breast-stroke without pain. I’m still doing my physio and not overdoing physical activity – but the knee is definitely on course for a complete healing. I can’t wait for the day when I start running again. Praise God!